Right from the start it’s apparent that this is going to be a big story, both in terms of scope and continuity. Picking up some of the lingering plot threads from the fiftieth anniversary adventure ‘The Day of the Doctor,’ there’s quite a long exposition sequence to catch viewers up before the story then goes on to- still before the credits even begin- explain that Ingrid Oliver’s Osgood is back as the latest in an increasing line of hybrids this series has featured. Also returning, though, are the Zygons, and the focus is solely on the shape-shifting creatures for the first time since their debut in ‘Terror of the Zygons.’ As it turns out, quite a lot has happened on Earth in the past couple of years and, with a leap of faith, the Zygons have brokered a peace treaty with humanity that allows 20 million or so of them to live amongst humans in secret. Both sides seem to know just how inherently tenuous and fragile the treaty is, and perhaps it’s fitting that there is a ‘Nightmare Scenario’ codename prepared. The action picks up immediately, offering little time for any character or viewer to catch his or her breath. And there really is a sense of global scale to this tale, events not limited just to the UK this time. With an event of this magnitude occurring, it’s only natural that UNIT would be spearheading the charge and keeping track of the disguised aliens, and Jemma Redgrave effortlessly reprises her role as Kate Stewart. Likewise, Jenna Coleman’s Clara returns in a much more prominent role this episode and by story’s end has been cloned and become a terrifyingly and powerfully dangerous foe, on the small scale by aiming to shoot the Doctor out of the sky and on the big scale by assuming a position of control in the rebel Zygons’ plans to break the treaty. As the Doctor and UNIT travel to Truth or Consequences, New Mexico- seemingly at least partially a ploy by Clara (going by Bonnie) to get them out of her hair- some of the best sequences in the episode are offered, putting on full display just how unique the threat that the Zygons can offer is. With UNIT troops encircling a church, a group of innocent civilians emerges. The challenge is in determining if these people are Zygons or not, and the tension and intrigue is written and played perfectly. It’s a testament to everyone involved in the episode, especially writer Peter Harness and debut director Daniel Nettheim, that the Zygons, who already naturally feature such fantastic costume design and voicing sound effects, can be perhaps even more effective when in their human guises. Due to their relatively infrequent appearances in all forms of media, the Zygons still retain an air of mystery and menace that is played to great effect throughout the episode. With so much action and setup, Peter Capaldi stays more in the background this time out for the first time all series, though his presence is always felt. This is an opening instalment that will be very dependent on its closing half, much more than the previous first-parters this series, but it still manages to get through an awful lot and doesn’t shy away from offering some political opinions as well. 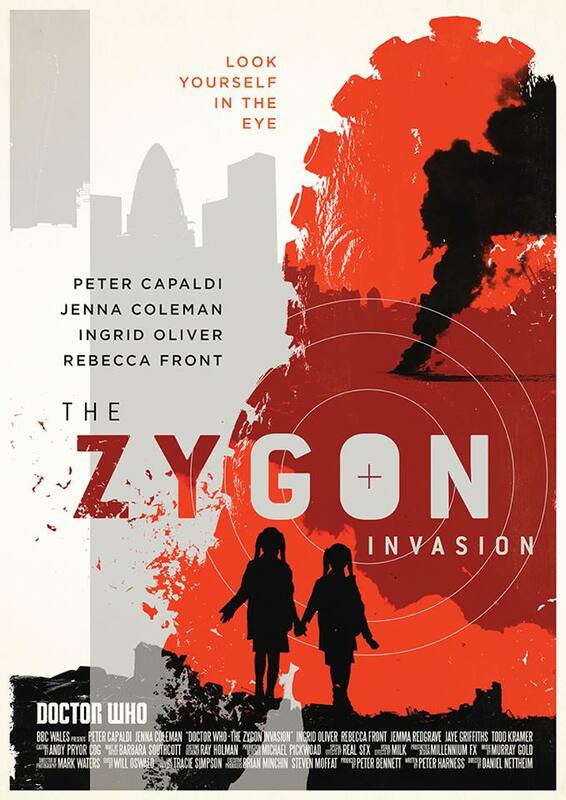 The upcoming ‘The Zygon Inversion’ has a lot of work to do in explaining the cause of the Nightmare Scenario and offering a successful resolution, but ‘The Zygon Invasion’ is still an immensely enjoyable and tense adventure that is another strong entry into this increasingly stellar series.